FACT CHECK: Do Motorists Now Face $999 Fines and 3-Year Suspensions for Using Cellphones While Driving? Do Motorists Now Face $999 Fines and 3-Year Suspensions for Using Cellphones While Driving? A number of recent laws have focused on preventing distracted driving, but the penalties vary from location to location. Motorists will be fined $999 and have their licenses suspended for three years if they are caught using, or even holding, cellphones while driving. This message was lacking some important details, such as where this law was supposedly implemented. Although a number of states and countries have started cracking down on distracted driving through the passage of related laws, they do not all specify the same punitive measures for violations of those laws. 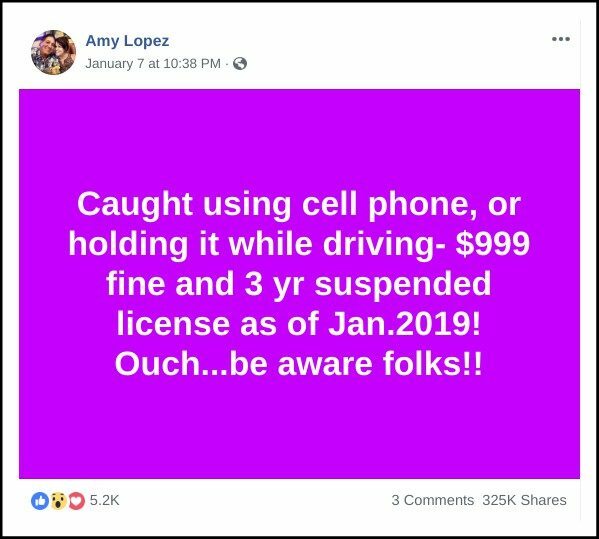 This Facebook post appears to be referencing the new distracted driving laws implemented in Ontario, Canada, at the start of 2019, but message still managed to fudge a few details of that law. For instance, drivers in Ontario could face three-day (not three-year) license suspensions if caught using their mobile phones while driving. 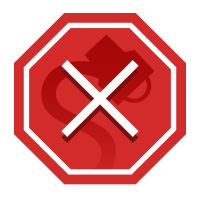 The size of attendant fines also varies depending on factors such as the type of license an offending driver holds, the length of time they’ve been driving, the number of previous violations, and whether they choose to fight the ticket in court. We could not find any laws on the books in any jurisdiction that would result in both a $999 fine and a three-year license suspension for those ticketed for distracted driving. However, we did find some other locations that levy fines of $1000 upon distracted drivers. While most distracted driving consequences in IL include penalty fees of between $100 and $150, punishments may be much more severe depending on the nature of the crime. For instance, first offenders generally need to pay a fine of $75, while drivers who violate the state’s law for the second time must pay $100. After the third or fourth distracted driving ticket, motorists must pay $125 or $150. If the violation results in a death, then the driver will be convicted of committing a Class 4 felony. Class 4 felonies generally result in a fine of up to $25,000 and/or between one and three years of imprisonment. If the violation results in great bodily harm, disfigurement or permanent disability, then the driver will be convicted of a Class A misdemeanor. Class A misdemeanors include a fine of up to $2,500 and/or up to one year in prison. There is no universal texting and driving law. If you’re curious about the distracted driving laws in your area, it’s best to get your information from a government website and not a social media post.